Nope, deffinitly Chicago to Wisconsin. Minnesota doesn't hate Wisconsin nearly as much as we do. By no means do I mean to discredit the Illinois - Wisconsin rivalry I'm sure it gets pretty heated... but come on man dont you ever watch sports "Vikings Packers" every winter (Randy Moss mooning the Green Bay crowd) "Twins - Brewers" (the number of Minnesota travelers every year for the MLB nicknamed "rivalry" games - the generic equivalent of cubs/whitesox) and mst itself has several Minnesotan castmembers that play up to this. Either way, lets just agree that its fun to make fun of cheeseheads. First off, not a man. Second, do you realize that most of the mst3k people from minnesota are originally from Illinois. In fact, I live down the street from where the Ep Guide says Deep 13 is located. Obviously, thier ties to Illinois are strong. I've lived in both Minnesota and Illinois and until you live here, you'll never know the deep hatred we have for Wisconsin. 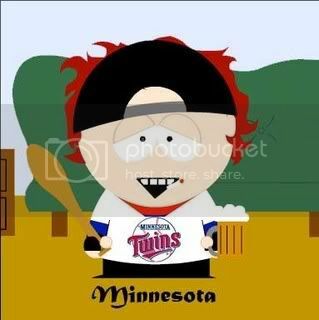 Fair enough, just wanted to make sure you realized that we Minnesotans take pride in our Wisconsin bashing as well. Is there any one that doesn't? While randomly browsing YouTube, I found an instance of "SLEEEP!" Check out "Posture Pals" (an old fave of mine). Damn, I SOOOO want one of those posture crowns. I better study hard for my next posture test. You might win, but we all know it's been fixed. It's like that everywhere. Arkansas bashes Oklahoma...and Mississippi. Georgia bashes Alabama. Alabama bashes Mississippi. Everybody nearby bashes Louisianna, because they're too busy electing corrupt politicians to bash back. Oh, and everybody makes fun of Texas because they take it SO personally. Oh, and everybody makes fun of Texas because they take it SO personally. I used to live in Virginia. We were next to a state that didn't even have the decency to come up with its own goddamned name. Any referance to Oretga is hilarious to me.